Logo reproduced with kind permission from Attitude & Ideas Inc.
Special event station chain commemorating D-Day. 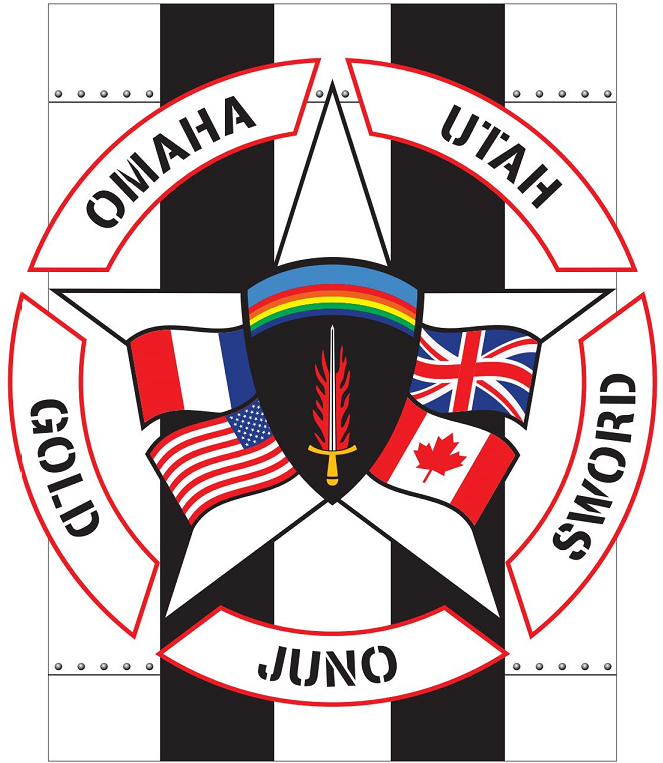 On top of the Stripes, you will find the Invasion Star which incorporates the 5 beaches of Normandy from the D-Day Invasion on June 6th 1944 (Omaha, Utah, Sword, Gold and Juno). In the centre of the Invasion Star you will find the SHAEF insignia, surrounded by the flags of the countries that had the largest impact on the invasion. The design of the insignia for the Supreme Headquarters Allied Expeditionary Force (SHAEF) was approved by General Dwight D. Eisenhower, Supreme Commander for Operation OVERLORD, and came into general use in March 1944. Each element in the insignia is symbolic. The main feature is the flaming sword of avenging justice, shown piercing the black of Nazi oppression. Above the sword is a rainbow, symbol of hope, containing all the colours that made up the national flags of the Allies. Then above the rainbow is the blue of peace to come. 6th June 2019 - 0630UTC to 2359UTC.